Home » Forums » Trip Planning » General Trip Planning and Transportation » Girls Trip to Food and Wine 2017 Trip Report. Girls Trip to Food and Wine 2017 Trip Report. So I was really thinking I really really wanted to go back to Disney this year and do food and wine again. So I looked into pricing it out and missing the least amount of work as possible. So decided to do a Friday to a Monday in September. At first I was going to later in the month but both rooms and flights were more expensive. So I checked out the weekend of 9/15-9/18 and it was a pretty reasonable price. I have choose the cheapest Resort which was the All Star Spots Resort, not really excited about staying there but hey its the cheapest and I doubt I will be in the room much. And I am still working on what flights right now out of Boston I can get a round trip flight for 154.60 which is ridiculously cheap! So then I got thinking that I don't really want to go alone so if I split the room and everything with someone then I could go for even cheaper. So I asked my mom if she want to go and she is going to go with me. This will be her first trip to food and wine. I am a little nervous about it being the weekend and crowded but I think it will be ok. I looked and apparently food and wine is starting even earlier this year. According to Disney's website it is starting August 31st. SO it will be two weeks in when we go. And we think we are going to try to catch a later flight on Thursday evening so we have all of Friday to be there too. I haven't come up with a game plan quite yet. My thoughts and lessons I learned from last time, is that it is super hot during the day to walk around and eat all the food so I am thinking of doing food and wine more towards the evening opposed to the daytime. I also definitely want to go to MK and see Pandora at Animal Kingdom. So trying to fit that all in from Friday, Saturday, Sunday, and half a day on Monday. This should be interesting. My thoughts and lessons I learned from last time, is that it is super hot during the day to walk around and eat all the food so I am thinking of doing food and wine more towards the evening opposed to the daytime. I also definitely want to go to MK and see Pandora at Animal Kingdom. So trying to fit that all in from Friday, Saturday, Sunday, and half a day on Monday. This should be interesting. How fun! Food & Wine is a fantastic girls trip. OK - September advice, after my 2016 September trip. It is crazy hot and humid (though I thought June was worse), so take your time and do everything in that slow southern style. Don't rush anywhere! Take lots of breaks and make air conditioned areas a priority (World showcase movies & shows, walking through the shops, etc). Get Parkhoppers so you can leave if the F&W crowds are obnoxious. I don't usually get them and it was completely worthwhile to me last September when we only had a 3 day trip. If you are worried about crowds though you need to be out of Epcot by 4pm. Disney has gotten better at providing shaded tables to eat around the world at. You're going to really weigh what you dislike more, crowds or heat. I chose crowds and we managed the heat by picking shaded table, cool drinks, and moving slowly with A/c breaks. Sunday is usually the slowest weekend Food & Wine Festival day crowd wise, especially in the evening because there are fewer locals there drinking. Plus, September is generally a low tourist time of year because kids are back in School, so Sunday night may be your perfect Food & Wine Festival time to avoid both crowds and heat. Animal Kingdom tends to be even hotter and more humid than Epcot because of the lush tropical environment, I would hit AK after dark. Plus Pandora is supposed to be pretty awesome after dark, and Expedition Everest is amazing after dark. We loved AK after dark, it was really one of the highlights of our trip and Pandora wasn't even open yet. Agree with everything Kristen said. September is HOT so be prepared to take air conditioned breaks. I've done F&W on a weekend before and yes it was crazy crowded, but you'll be ok as two adults as long as you are prepared for it. Daytime on the weekends is not nearly as bad as evening. All great points I have to take into consideration. If it were just myself I would have no concern with being out in the hot sun. Adam and I took several breaks and tried to hide in air conditioned areas and drank lots and lots of water. My only concern with my mom being in the sun is she was diagnosed with melanoma skin cancer in October 2015. She had a surgery that took a large portion of her arm off were she now has an indentation. She is currently in remission but so much exposure to sun isn't so good for her. She is going to have to wear a large hat and she usually wears like the light underarmer long sleeve stuff. So we will have to see how she does and go from there. She is pretty used to it at this point, but Florida heat is a little hotter than it gets in NH. I am thinking we are going to be flying in the evening of Thursday September 14th. I think we land around 9pm so there won't be much to do other than check into the resort and probably grab something to eat. I really wanted to do the Boathouse but I don't have any idea when we will actually arrive to the room and then we still have to take the bus to get there so it would probably like 11pm and that's just too late so we will probably just have to grab QS at the Resort. Of course those are just the flights I am currently looking at. Waiting for Southwest to release for September. Then I am thinking Friday of doing MK then either do Epcot or Animal Kingdom in the evening if we do everything at MK. I also want to try Skipper Canteen. Since they changed their menu they have a lot more appealing stuff and they have a lot more gluten free stuff for me. So thinking of grabbing a reservation to there for lunch. Saturday and Sunday will be tough ones, I am thinking pretty much everywhere will be busy so its really going to have to be a guessing game. But I think Sunday we will try to do Food and Wine during the day that day and then hit Animal Kingdom or MK for the nighttime. I am also possibly hoping that there might be MNSSHP and might be able to talk my mom into doing that. Although it is more money I still really enjoy the party. Another thing that we are definitely thinking about is the park to park express pass if they offer it when we go. It looks like its an awesome and really easy way to get to the park and you get to skip security as well as be dropped off inside the park instead of walking five million miles from the bus area witch is really nice when you are on limited time. So everything right now is still dependent of flights as well and how the crowds are going to be. Get there as early as you can. A good number of the food locations are open early. Temps really heat up after 1PM. All Star sports has great pools, an afternoon break from sun and heat at the pool is nice. Then back to F&W after sun down. It will be crowded in the evening. It gets to be a bit of amateur hour and the drink part of the festival kicks in. Do not forget the festival center either. Sign up for a wine tasting or food tasting there. There are some inexpensive seminars, they are a lot of fun, indoors, with AC. The do book up quick, sign up usually starts in August. F&W is my favorite event. There is a lot more to it than the food huts in World Showcase. Thank you we never did check out the Festival Center when we were there in September. I have been looking around a lot and not really liking what I am hearing about the All Star Resorts so I think we might go with POP. It has it's own bus and seems like a pretty good resort. It was less than $100 to do a preferred room there. Although I am not booking until the deals come out so that I can possibly get a discount of free dining. So It probably won't be until April. Looking at flights we might also change those too. We might end up taking and extra day off from work and flying down at 6:30 am on Thursday and the come back Monday morning, which might work out better crowd wise. When we took that same flight in September we were at Magic Kingdom park by 11am. Thursday is a great day for the Festival. The Festival Center activities come out in August and a good way to miss crowds because the events are limited in size. Ok, so I have been seeing on Facebook all these people talking about renting DVC points and saving all kinds of money so I was like I wonder what this is all about so I looked into the DVC Rental Store and if I wait until February 14th I will be in the 7 month mark so I can try to get Boardwalk, or Beach Club for 15.50 per point or try for Saratoga or Old Key West at 15.00 per point. Boardwalk is only 46 points for the for the 14th to the 18th so I am really hoping I put in for a standard view studio for all of them. I actually did Boardwalk 1st choice, Beach Club, Saratoga Old Key West, and The Wilderness for the heck of it because its my favorite resort, but way more points to stay there, which I don't really understand, Boardwalk is a way better location wise than Wilderness. Crossing my fingers something is available. If we do get boardwalk for that price point it would be 713 for the four days I can't really beat that for the location and with the price of tickets and the price of added plus the memory maker it is around 860 for each of us and less than 1,000 for room and tickets was my goal for this trip. Then last night it found out that they will be doing a character breakfast at Trattoria al Forno on the boardwalk, and it is going to feature Disney couple such as FLYNN RYDER AND RAPUNZEL! OMG! I absolutely need to get reservations here, I literally don't care how much it cost I NEED to meet Flynn Ryder. I don't even care about eating! I have to show him and Rapunzel pictures from my wedding and everything I really hope I can get in I am betting this is going to be an uber hard reservation to get. I am going to try to do it Friday morning 9/15. Here is the article if anyone else is interested. It also says Ariel and Eric will be there. I have also never met Eric so that would be exciting, my third favorite prince. My second is the beast, (Prince Adam). There will most likely not be any availability at Boardwalk or Beach Club at 7 months out. Those are hard to book at 7 months out during normal times of the year, but during Food & Wine it will be nearly impossible. Especially if you're going for a standard view studio which would have been the first to book up at 11 months out. I booked two Boardwalk Villa studios at 11 months out for November 9th - 18th. Only a couple of those days fell into Food & Wine time and there were still no standard view studios available for any of my dates when I booked. I'm super excited for that breakfast, though! I've wanted them to do a prince meal since forever and my daughter (and me, who are we kidding?) are going to be super pumped to meet Eric and Flynn as those are our two favorites. Yeah I wish I had know about it earlier I would have done it even at 17.00 per point, I figure at this point two weeks isn't going to matter and if they have a room they have a room and leave it up to fate. I really hope we can get in there but if not just being in the Epcot area like Saratoga or Old Key West is fine too and both of those are really nice laid back resorts and are actually slightly cheaper because they aren't a premium resort. We shall definitely see in a couple of weeks. There is always someone who might cancel or change their reservation so we can get in. I know you never get the meet the princes so I am super excited as well. If we get reservations at a resort I can do my ADR's in 45 days. I will find out if we can get a DVC room on Tuesday crossing my fingers and hoping for pixie dust for Boardwalk. So I think we are going to do the flight on Thursday morning out of Manchester, NH airport at 6:00am. We should be there around 9:20 when me and Adam went in September we got there like 30 minutes early. I plan on doing the pre check in like last time but I am not sure if room will be ready if not no big deal. My plan is to take the Magical Express to resort (Hopefully Boardwalk) then take the transportation to Epcot. We can then do food and wine stuff as we should just be getting there before 11 so perfect time plus we probably will be starving. So we can go around the countries and try to try everything, then we can go back later and get what we loved again. Then taking air conditioned breaks and check out the countries and do a few rides especially the new Soarin my mom hasn't been on it yet and last time we were there isn't wasn't much of a wait. I don't think I will do any fastpasses as my plan for later is to go to Animal Kingdom. So I hoping they will still have the new park to park express bus pass when we go because it will be super awesome for us. After we get done at Epcot I want to go to Animal Kingdom and do all the nighttime stuff especially the new Pandora stuff this is where my fastpasses will come into play. Hoping we get to do everything but its going to be super popular because its so new. After that I don't have a plan for Friday and Saturday because I am thinking those are going to be the two busiest days. I think we may attempt to go to MK on Friday morning. Sunday I think its going to be back to Food and Wine and then MK at night I think it will be less crowded at night do to being the next day a school day. I just scored a Pool View room at Boardwalk during Food and Wine still in a little bit of shock. I am trying to not be too excited about it as I still have to pay the deposit and stuff and she hasn't gotten back to me about that, but holy cow. It was a little more because of the view but what the heck! You only live once right so might as well spend the little extra. It was less than $100 each for us to get that room so why not! Me too this is the first time renting through a place. Idk if I mentioned it but its the DVC Rental Store. I think if everything works out and we have a good trip I am definitely going to use their services next time. I mean we got a pool/garden view DVC room at the Boardwalk for Food and Wine for less than what it was for a moderate resort per night. Boardwalk is so hard to get during Food and Wine. We've had eight days waitlisted in October for weeks now; we would've booked right at 11 months since it's our home resort but we've been trying to coordinate trips with family and they keep changing their minds as to what they want to do. Yes we want April, no wait October, no wait NEXT April, etc. So anyway, don't feel too bad if you can't get Boardwalk, it's nothing you did wrong. It's just wicked hard to get. 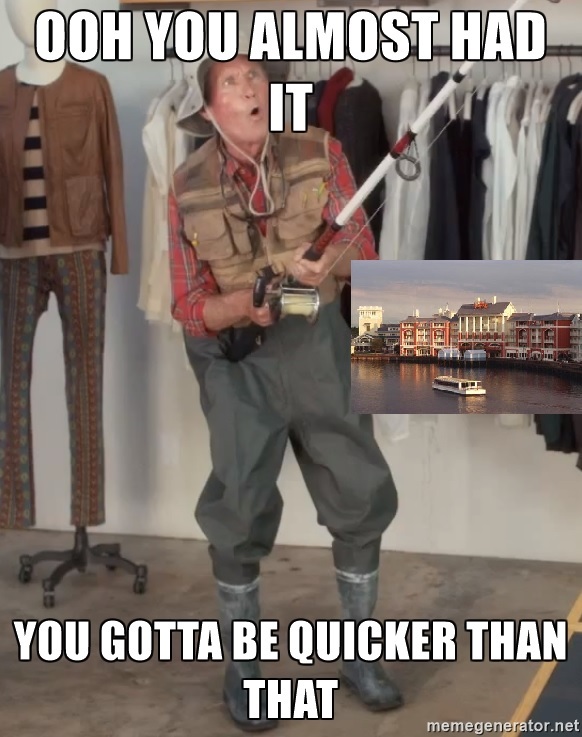 So they came back at me again and said I lost our arrival day for the resort I was looking at which was Bay Lake Tower. So I asked if the Poly was still available, meaning getting very frustrated because at this month it has been nearly a month of trying to get a room and other people are saying they are getting rooms right off. So I decided to look into David's DVC Rental, and already the communication has been better. In the meantime I asked the girl from DVC Rental Store if the poly room was still available and she said no then sent me a list of places that has studio rooms available for my dates, guess what was on the list! So how is it not available one minute then you tell me it is, but apparently its not? I said forget it and asked for the money I ended up having to put down to reserve the room at the Boardwalk we didn't get. I don't know if it was the agent I was working with or the agency but I got tired of that. The communication has been way faster and better through David's. I currently have a request in for a Lake View Bay Lake Tower room and really crossing my finger. I am supposed to hear back today if they find a member who wants to rent the 76 points out to us. Better than waiting two weeks to hear if we got it or not! Switched to David's DVC Rental, and within 4 days got a resort reservation confirmed! Although it wasn't BLT we are still pretty excited. Animal Kingdom Kadani Village Resort Savannah View Studio! We both are really excited I remembered when this resort first opened and Samantha Brown from the Travel Channel stayed there with the Savannah view and did a whole story on it. I think I watched that one like 900 times. Does she even still do that anymore? I know its a bit of a bus ride away from everything we really wanted to do but its ok, we will just have to make sure to give ourselves extra time to account for that, both of us are pretty used to getting up early so shouldn't be an issue. And the day we want to do breakfast at Boardwalk we are going to take an Uber. Congrats on Kidani!!!! I could watch the savanna animals all day. AK is our happy place. The buses are much better at AL than they used to be. The schedules are posted on screens, they run close to every twenty minutes. No sharing buses with the other resorts anymore. We had no problems this year. Congrats! I've only heard great things about David's so happy to hear it worked out for you. Ken and I hope to stay at AK sometime soon. Yay! I am excited that you all say AK Kadani Village is good! It looks beautiful and I am very excited! Today I purchased my dress for my costume for MNSSHP. Can you guess who I am going to be? 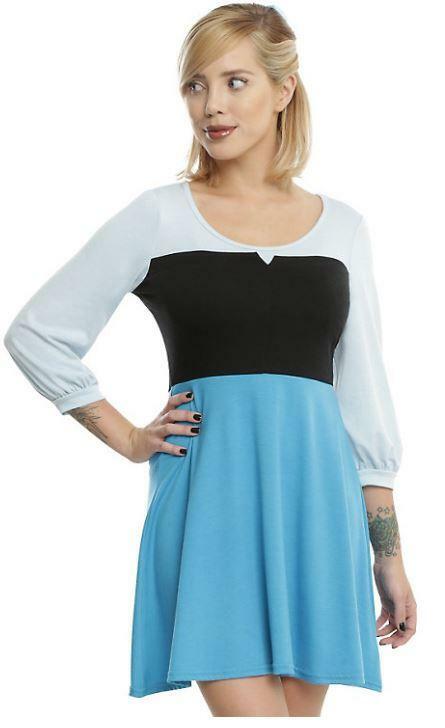 Just got to get a wig but I can get that later on but the dress was 25% off today because of St. Patrick's Day. And tomorrow is our ADR Day. I figure I can always change the time for this one as it never seems that busy. All these are of course what I am aiming for but no guarantees. But I don't for see any of these being a problem to get if I am right on it. What a cute dress, where did you find it? I got it from Hot Topic. So I got all my reservations and pretty much all the times that I wanted even though I totally spaced it on Saturday morning and forgot about doing them until like 10am! Super stoked for this one to meet the characters but after breakfast we are going to try to run to Epcot opening and since we will be at the international gateway we might be able to get to Frozen as soon as it opens and get right on instead of using a fastpass or waiting in a super long standby. Personally I don't think this ride needs a fastpass or super long stand by I could do without it other wise. Yup, I need that dress. So I haven't updated in a while so here is what is new. We decided to fly down Wednesday afternoon, flight leaves at 3pm we land about 7pm. So when the room sales dropped we ended up getting a room at The Boardwalk Villas, a standard studio for one night which is actually pretty convenient because Thursday is EMH at Epcot. So we will land take the Magical Express to The Boardwalk, go find our room real quick, then go catch the bus to MK, because its open until 11 that night and probably grab a snack or a QS meal there and I think we are going to try to catch the new show but I don't think we will make it on time but we have other times we can see it. Check out of Boardwalk leave our bags to be transfered to Animal Kingdom Lodge. Head to Epcot for EMH, try to head straight to Frozen from International Gateway to get right on. Hit up Soarin, and Test Track and the other rides until the countries open then start doing Food and Wine. After all that we are heading over to MK to hit some more rides and try to watch the new show if we haven't seen it yet. Not sure what the plans are quite yet but checking everything out plus the new stuff. Then maybe taking a break miday being so hot out, then back to Epcot for more food and wine for the evening, if its too packed we might go to HS and try to get on Toy Story Mania. Then to AK for the rest of the night, see Pandora at night time and I currently have Tiffins Rivers of Light reservations for first viewing but I haven't decided if I am keeping that or not. I am not totally sure its worth what it is for a 15 minutes show. Super early check out and Tragical Express bus. Plans have changed a bit. I had a little more vacation time than I thought I did so we decided to change out outgoing flight to the early morning one so we get more time. Head over to Epcot to enjoy some food and wine bits for lunch and hit a few rides there. Head over to MK for dinner time. Have a quick breakfast on the boardwalk then head right over to International gateway to book it to Frozen Ever After ride. Hit some rides in Future World, then do some more Food and Wine later. Head to animal Kingdom to enjoy some things over there and check out our room/ view at Kadani Village. We probably won't be spending the whole day here and might just go to the park with the lowest crowds by checking the Disney Experience app. Sunday September 17th LAST DAY! HS for Toy Story Mania and check out other things. Then back to Epcot for more Food and Wine. Next day we have to get up at like 4am to board the Tragical express. Got all the fastpasses we wanted even the Pandora fastpasses! So excited. 50 more days to go! Congrats! I've heard those FOP FastPasses have been harder to get recently. Woo hoo!!! I got mine for next week and our October trip dates open soon!